The end of season play-off system has its detractors, viewed by many as a money-making exercise that often penalises the clubs who have shown the greatest consistency. On the other hand, it does offer the smaller clubs an outside chance of making the big time, thanks in most cases to a late season run of good form. One such club to benefit was Union Deportiva Vecindario, who out of the blue, reached La Segunda for the 2006-07 season. 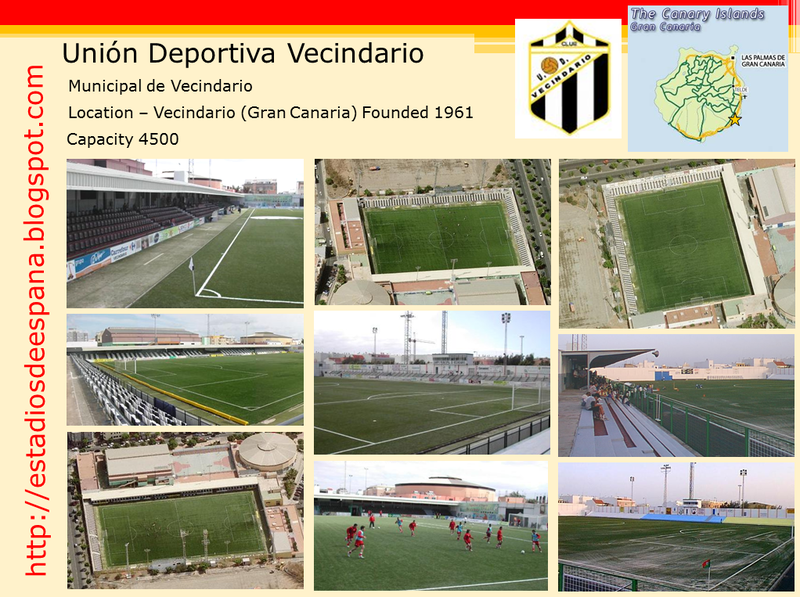 Founded in 1961 following the merger of Canario & San Rafael, UD Vecindario spent its first thirty years playing in the Canarias regional leagues. The Tercera was then home for eleven seasons before the club debuted in Segunda B in the 2000-01 season. A brief return to the Tercera followed in 02-03, and then a steady period back in Segunda B. Then, when nobody was looking, it won promotion to La Segunda in June 2006. 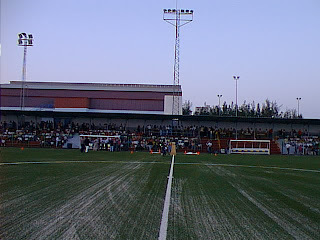 The 2005-06 season had started slowly for the club, but as the weeks progressed, Vecindario homed in on a play-off place, securing fourth spot with a week to go thanks to a win away at Atlético Madrid B and local big-wigs UD Las Palmas ending Rayo Vallecano's dreams of promotion with a 1-0 win of their own. 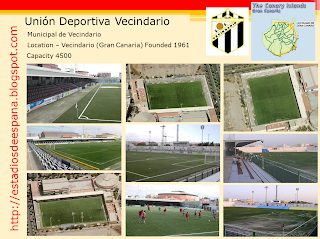 To be frank, not a great deal was expected of Vecindario in the play-offs, but a 3-2 aggregate win over FC Cartagena, followed by a more convincing 4-1 aggregate victory over Levante B ensured promotion to the second tier. With the lowest budget and an inexperienced squad, the doom-merchants were forecasting Vecindario's relegation before a ball of the 2006-07 season had been kicked, and for once they were not wrong. The club did not disgrace itself, even gaining the satisfaction of wins over Canarias rivals UD Las Palmas & CD Tenerife, but in the end the gulf in class was too much. Vecindario finished 22nd & bottom of the table, some 19 points off safety. The stadium did have the distinction of becoming the first to host regular matches on an artificial surface in the LFP. Life back in Segunda B has been consistent, but unspectacular, with four seasons of mid-table finishes. The 2011-12 season has proved more difficult, and the club succumbed to relegation and dropped to the Tercera for the first time in a decade. Still troubled by debts accrued whilst in the second tier, Vecindario's failure to pay players and fulfill fixtures led to their demotion form the Tercera in May 2014. Back in Segunda B, but Vecindario & its stadium holds its own. Vecindario is a suburb of the sprawling conurbation of Santa Lucía de Tirajana in the south east of the island of Gran Canaria. From its formation in 1961 to 1987, the club made its home at the old Campo Municipal, a barely enclosed ground to the south of the town centre. In 1987, Vecindario moved a kilometre to the north of town and the current location. Back then, the ground featured a half length covered stand on the north side and not a lot else. An open bank of terracing was added to the southern side of the ground in the early nineties and following promotion to the Tercera, the old northern stand was replaced with a full length cover featuring five rows of seats beneath. Promotion to La Segunda saw banks of black & white seats added to the east and southern sides of the ground and the main, northern stand reseated. These improvements took the capacity to the current level of 4,500. The Estadio Municipal de Vecindario is neat, compact and very low-rise. Just to prove this point, the only features that are higher than 4 metres are the floodlights and the conical roof of the folk centre behind the north east corner of the stadium.